From driveways to parking lots to athletic complex and streets no job is too big or small. 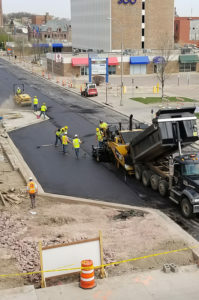 SealPros, Inc. has over 38 years of combined experience and is one of the area’s only full service asphalt paving and maintenance crews. Whether it is a new surface or improving an old one, SealPros, Inc. can take care of your project. Maintenance is the best way to protect your investment. We can install a new asphalt surface and provide long term maintenance protection. Pavement cracks are inevitable and without proper maintenance and repair, cracks will lead to accelerated deterioration. Research has confirmed that crack sealing is the most cost-effective method of pavement preservation. A sealcoat can be applied in many different ways, but there is only one right way for long-term durability. The first application by a squeegee machine fills the existing voids in the asphalt. Then, the second application, wearcoarse, is sprayed on to give protection from the harsh winters and snow removal. When these two applications are implemented correctly you are left with asphalt that will last for many years.